Last Saturday She Who Must Be Obeyed and I celebrated being married for seventeen years and managing not to kill each other. 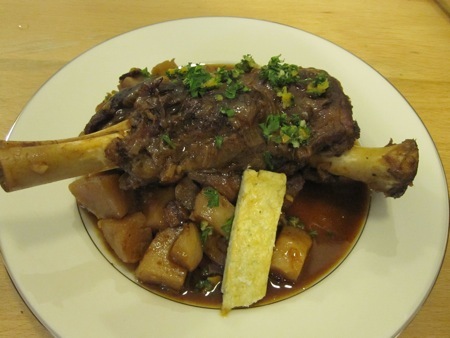 We had dinner out a few days earlier (Journeyman again, photos to follow in the next post), but I wanted to cook one of her favorite dishes, braised lamb shanks. There are countless recipes for this dish, but I chose to use Vadim Akimenko’s as a departure point. I bought the book (more like a thin magazine) when I met him at the Union Square Farmer’s Market a few weeks ago, but it is also available here. His recipe had the virtues of requiring only ingredients that I already had in the house, as well as including bacon. I warmed up the stock first. It thawed out overnight; what you’re seeing isn’t ice, but two big gelatinized slabs of lamb-y goodness. 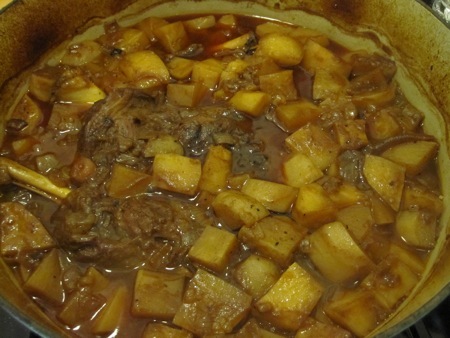 Here’s the thing, every time you cook a braise – and this is serious – you must anoint the pan with a cured pork product, skipping this step is an insult to the braising gods and will anger them. 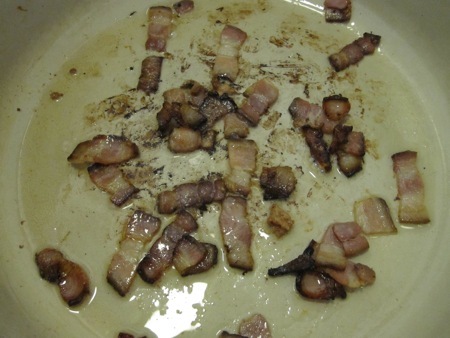 I removed the bacon, leaving the fat in the pot, and added a healthy dollop of extra bacon fat (You do have extra bacon fat in the fridge, don’t you?). I seasoned the shanks with salt and pepper, and browned them on both sides. 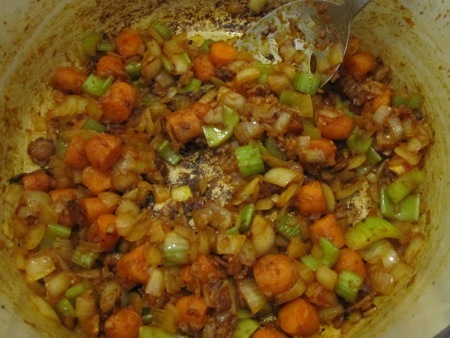 I removed the shanks and added the mirepoix, bacon, shallots, and garlic back to the pan, sweating the mixture until the vegetables were translucent. I added the tomato paste and continued to cook until the paste turned dark red. 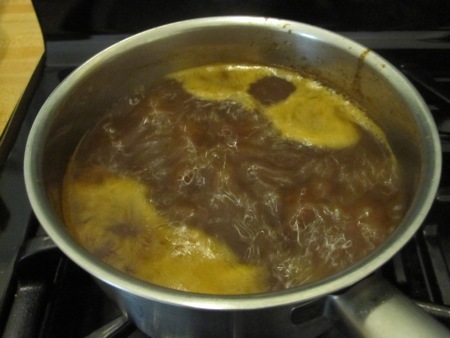 I deglazed with the wine and simmered until it was reduced by half. 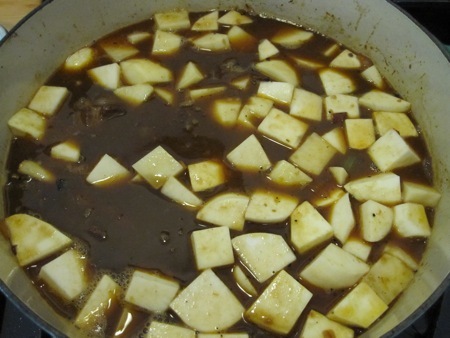 I returned the shanks to the pot, poured in the stock, and added the potatoes, turnips, and celery root. I brought everything up to a boil, lowered the heat to a simmer, covered the pot with foil and then the lid, then placed it in a 325°F oven for almost three hours, until the shanks were tender. 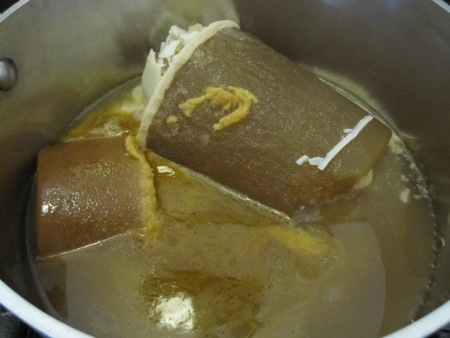 I turned the shanks and gave everything a stir at the halfway point. 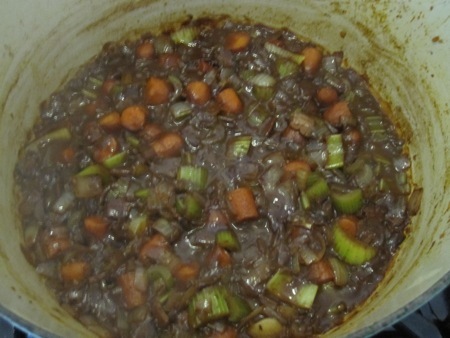 I drained and strained the braising liquid, removed the sachet, and left the vegetables and shanks in the pot to keep warm while I re-strained and reduced the sauce. 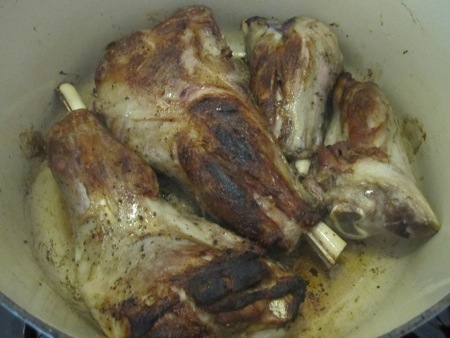 I skimmed off the fat, corrected the seasoning, and returned the sauce to the pot to warm up the shanks. 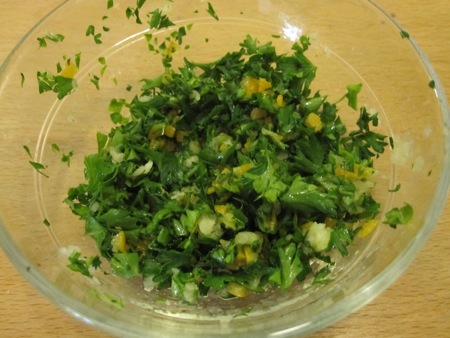 While the sauce cooked, I made a quick gremolata from a teaspoon each of minced garlic and preserved Meyer lemon and two tablespoons of chopped parsley. To plate, I rested a shank on a mound of the vegetables, added the sauce, and topped with the gremolata. I garnished each dish with a piece of savory lemon-thyme shortbread. It’s hard to beat a good braise on a cold night. Rich, fatty meat, earthy vegetables, and a silky sauce seem made for staying warm indoors. The addition of the gremolata provided necessary bite, acidity, and greenness to lighten the dish. 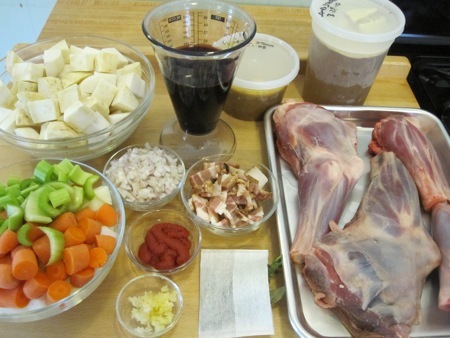 And, because braises always taste better after a rest in the fridge, we have enough for a second meal. I love it when a plan comes together. This entry was posted in food & cooking, local and tagged cooking, food, local. Bookmark the permalink.